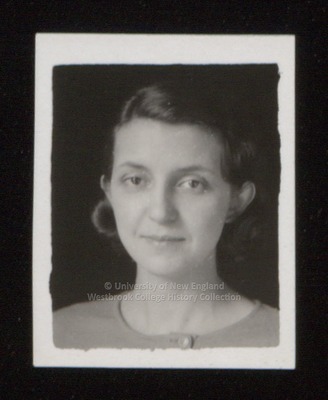 A ca.1934 Westbrook Junior College student portrait has written in pencil on the back L Nye. Miss Nye's hair is parted on the left and pulled loosely back to her ears, with a short tendril on either side. She appears to be wearing a buttoned cardigan.